Reputation monitoring for your business or brand is a critical part of your online marketing strategy. You need to know whether people are using your brand name or talking about your company on the Internet. You also need to keep up with the social activities & mentions of your competitors. In this post, we’re going to look at the top 10 tools under $100 a month that you can use to monitor your brand & your competitors on social media. In this post, we’ll also discuss how to monitor your competition on social media — so think about the above items for your competitors, too. The 2 things you should remember when handling mentions of your brand online are appreciation & professionalism. Appreciate those who make positive mentions with a simple thank you. Be professional to those who make negative mentions of your brand by offering to resolve their frustrations. Most social media interactions are public. Therefore, you want to show that your brand loves its supporters & provides excellent customer service to all — even the haters. For those smart enough to monitor their competitors, you should look for opportunities to improve your products & services as well as market your brand. If you see that people are complaining about your competitor’s product missing a feature, add that feature to yours. If you see that your competitor is going out of business, position your brand as the perfect replacement. Now that you know what to monitor, and what to do with the information you uncover — let’s dive into some great tools! If you’re just getting started with social media monitoring for your brand, here are some great tools to use for initial research. The tools mentioned in the next section will handle continued monitoring. KnowEm? allows you to check for the use of your brand on over 500 social networks & online communities. Use it to check for instances of your brand name on networks you’ve claimed, or ones that have been created by others using your brand name. You can also use this tool to find new social media networks to add to your marketing strategy. If you’re not sure which ones are best for your industry, try searching for your competitor’s name on KnowEm? to see which networks they’ve claimed profiles on. The KnowEm search is free to use. They also offer paid social profile creation services for those looking to claim their social profiles across multiple networks, which is great for businesses that are just starting out. Ubersuggest is a free tool that lets you see the top 10 suggested searches on Google for any keyword or keyword combination. Use it to find potential content ideas for your blog or social media accounts. You can also use Ubersuggest for competitive analysis because you’ll be able to see what people search for in regard to your competition. These searches could lead to inspiration for new material. Complaint Search from Go Fish Digital is a free tool that lets you see what people say about your brand on sites like Ripoff Report, Better Business Bureau, etc. Why is this important for your online marketing? You can use it to address common concerns about your business on your social media accounts. For example, if people complain about billing issues, start by writing a blog post to address those issues. Then link that post to your Facebook page to show fans & customers you’re aware of the complaints & you’re taking steps to resolve the problems. Once you have your base research completed, you’re ready to set up daily monitoring tools to keep you up to date on changes & mentions of your brand — and your competitors. Here are some good tools to try. Google Alerts sends you email when the search engine finds a mention of your company on the web. You can set it to look for your brand name in all sources, or specifically in web results, news results, blog results, video results, book results, or discussion results. You can also use Google Alerts to monitor your competitors by setting up alerts for their name & related keywords. You can monitor alerts by RSS if you want to lower the number of incoming messages to your inbox. Use HootSuite to create columns that monitor your Twitter mentions, Facebook wall posts, and searches on Twitter, Google+ and Facebook. You can also use the search columns to monitor your competitors. HootSuite is free for up to 5 social media profiles — with plans starting at $8.99 per month. Social Report sends you daily email that reports social media activity across dozens of networks, mentions, Google Analytics data & much more. Instead of visiting a dashboard, you just check your email to get the most important information about your online presence. Social Report plans start at $9.99 per month for up to 10 accounts & basic features, or $39 for up to 50 accounts & most of the monitoring features. Cyfe lets you track Twitter mentions, Facebook posts & social searches – along with other pieces of data about your brand & competitors. You can create monitoring dashboards that give you insights into your social media along with your website traffic & search presence. You can also use Cyfe to send regular reports with the data in each dashboard you create, including your monitoring dashboard. Cyfe offers a free plan with limited widgets & dashboards. Plans with unlimited widgets & dashboards are $19 per month. Rankur allows you to monitor mentions based on keywords, brands, personal reputations & local businesses across Twitter, Facebook, Google, images, video, news, blogs & the web. You can also add competitor monitoring to the mix. Rankur offers a free forever plan for one saved search, one user & unlimited mentions. Plans with additional searches & features start at $24 per month. Mention lets you monitor brand mentions on social networks, news sites, forums, blogs or any web page. Best of all, you can reply to tweets, see web page content (news, forums, blogs, etc. ), and get direct links to Facebook posts that mention your brand. Mention is free for 2 alerts & up to 250 mentions per month across all channels. Plans start at $29 for more alerts, mentions & features such as analytics & mention history. Mention users can also take advantage of Zapier, a service that lets you integrate different tools together for advanced functionality. For example, you could create a Zap that adds a new task to Trello & assign it to a specific member of your team when a new mention of your brand appears online. You can see more integrations by viewing Zapier’sMention Integrations or browse the Zapbook for other tool integrations. Trackur lets you review mentions of your brand on social media & blogs in a compact dashboard — complete with sentiment & influence analysis for each mention. Along with discovering new brand mentions, you can bookmark the best ones for future reference. This feature comes in handy when collecting social proof & testimonials. You can also use the tool to track mentions of your competitors. Trackur plans start at $97 for 50 saved searches & alerts via dashboard, email & RSS. Rival IQ lets you go beyond mentions to monitoring the social media strategy of your brand versus your competitors. Use Rival IQ to compare social media bios, activity & content popularity while monitoring changes made by competitors on social media & websites. Plans start at $99 per month to monitor up to 10 companies. No matter what other monitoring tools you choose from this list, Rival IQ will give you data you won’t find anywhere else! 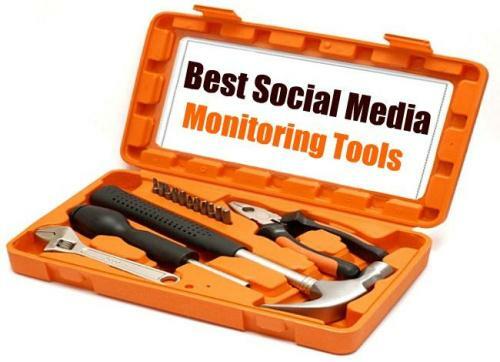 As you can see, there are many tools that can help you monitor your brand presence & competitors on social media. You can stay on top of any reputation management issues that need to be resolved, keep your customers happy & make your brand advocates love you even more by simply noticing them. Keep the overall sentiment about your brand positive & you’ll rule your industry in no time!